Healthy Relationships Don’t Just Happen! When a person is in healthy relationships, that means some boundaries are established such as respect and other things. Here are some encouraging scriptures concerning healthy relationships. How Can I Be More Involved In Healthy Relationships? Are You In Some Healthy Relationships? Healthy relationships are wonderful, yet they take a lot of time and energy! 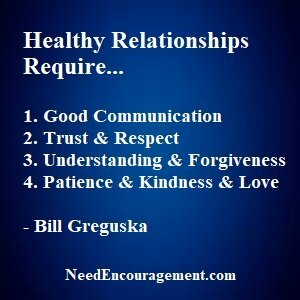 How do you build healthy relationships? What do you look for in them? You will find out that they are worth the effort you invest in them! Being in healthy relationships is one of the best things in life! A relationship is sometimes one of the hardest ships to sail without ending up crashing into the rocks because of poor navigation. God’s word has much to share when it comes to relationships with one another. Do the relationships that you are involved in reflect what Jesus taught in the Bible? Take time to check out this page and then open your Bible to learn more about healthy relationships. Where Do You Stand Concerning Healthy Relationships? Been married, but you are hoping to be married someday? Have you been married and divorced, and you never want to get married again? Have you been married and divorced, and you would like to get married again possibly? Healthy Relationships Take Dialog And Effort!